The health care industry is in the midst of a major shift from volume to value, and data transparency and clinical benchmarking are critical to this transformation. Clarity into how quality and costs are measured — as well as how your performance compares with other systems and facilities — is essential to your organization’s ability to reduce clinical variation and improve patient outcomes. The Vizient® Clinical Data Base (CDB) is the definitive health care analytics platform for performance improvement. CDB provides high-quality, accurate and transparent data on patient outcomes — such as mortality, length of stay, complication and readmission rates, and hospital-acquired conditions — that enable hospitals to benchmark against peers; identify, accelerate and sustain improvements; reduce variation; and expedite data collection to fulfill agency reporting requirements. Clinical benchmarking tools such as dashboards, simulation calculators, and templated and customizable reports enable you to quickly identify improvement opportunities and their potential impact. Resource Manager enhances patient- and physician-level data in the CDB by providing comparative utilization information for select clinical categories such as pharmacy, imaging, laboratory, blood and cardiovascular-vascular services. This information highlights clinical practice variation patterns and helps determine which resources are being used effectively. Core Measures helps fulfill data reporting requirements for the Centers for Medicare & Medicaid Services, The Joint Commission and state agencies, and compares your organization’s performance with clinical benchmarks. Vizient members have exclusive access to additional CDB and clinical benchmarking resources. 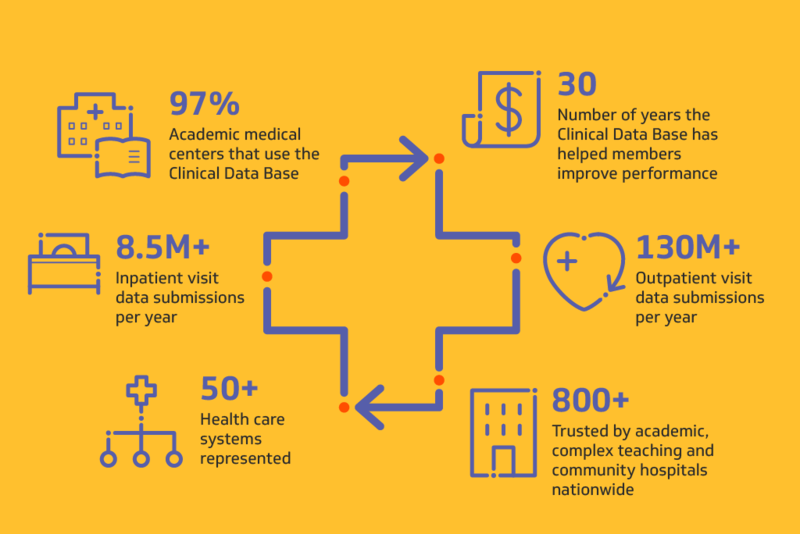 Connect with us to learn more about the Clinical Data Base.